The Buckeyes and Spartans opened up the Big Ten regular season with a tough fought classic B1G battle that ended with a 17-16 win for the now 5-0 Buckeyes. Braxton Miller threw 16-23 for 179 yards, a touchdown and an interception, and added 23 carries for 136 yards on the ground but with 2 fumbles. His effort was significant in securing the win against a tough, hard-nosed Dantonio team. As much as we wanted to believe the Buckeyes the Buckeyes were going to put together a much more impressive offensive performance, the Michigan State defense had other ideas. There are ways to be successful against the Spartans, and they aren’t the mobile QB killers they like to think they are, but they’re still a Dantonio defense. Playing them requires a slog through the mud that takes a level of intestinal fortitude few actually possess. Carlos Hyde may have been the saving grace for this team today. He ran tough all game long and gave the Buckeyes a first down on a third and four from the 50 late in the 4th quarter. His number may not be explosive, but they seemed to come when we needed them most. Andrew Maxwell played extremely well for the Spartans today. I can’t tell you how impressed I am about how much he has seemed to have grown in the last couple weeks. He could be a dangerous opponent next year if he can get a few better wide receiver targets. Thankfully his receivers dropped a few catchable balls today at key moments. The defense obviously still needs work, but they were very close to not giving up any touchdowns again. They blew that by deciding to try to strip the football instead of wrapping up and tackling. They need to change their focus in future weeks, especially against Taylor Martinez of Nebraska, who has improved his passing this year. This for Mr. Bell. Sans missed tackle, of course. Ring the Bell. Put as many silver helmets on Le’Veon Bell as possible. Wear him out before he wear the defense out. Speed it up. I’d like to see the offense speed things up to a pace similar to the Miami of Ohio game when they ran 85 plays. 3rd down. Silver Bullets: Get off the field on third downs, especially ones over 5 yards. XBrax360. Braxton Miller, do your thing. Under 80. Hold Le’Veon Bell to under 80 yards. MAY is going to try and run early and often. If the Buckeyes contain Bell and force Andrew Maxwell to beat them with his arm, they have a great chance to win. Hall and Hyde. There’s been some talk of both being on the field together. It will be interesting to see if that happens. And if so, what kind of plays will Urban Meyer have in store. Wrap Up. It has been hammered home as a point of emphasis, but OSU simply cannot miss open field tackles or they will be in trouble. It would be nice to see 2 or 3 guys swarming to the ball on every play. Throwing the forward pass is a big question mark for the majority of Big Ten quarterbacks. Their athleticism, though, is not. With that said, I give to you my 2012 Big Ten quarterback rankings. Last? I haz a sad..
12. 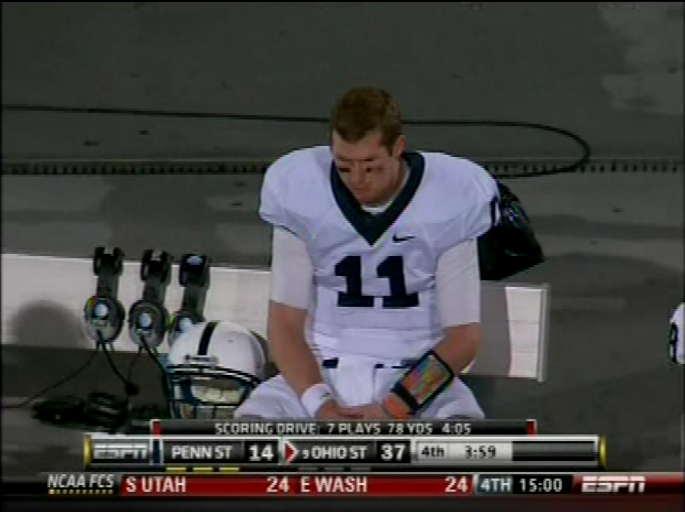 Matt McGloin (Penn State): McGloin has started ten games in his Nittany Lion career, but just hasn’t gotten any better. However, he’s far and away PSU’s best option at quarterback. Last year, McGloin threw for 1,571 yards with 8 touchdowns and 5 interceptions. With the Penn State program in such turmoil, it would be nice if they had a savior at quarterback. Matt McGloin is not that. 11. Tre Roberson (Indiana): Although he was just a true freshman, Roberson struggled as Indiana’s starting quarterback last year. His rushing ability can make him a dangerous player for defense to account for. And in Roberson’s defense, he plays for Indiana. 10. Andrew Maxwell (Michigan State): Maxwell sat behind Kirk Cousins for two seasons, not getting many opportunities to show off his talent. Inexperience is the reason why I have Maxwell ranked where I do. He’s got the physical skills, but just simply hasn’t played in enough games yet for me to rate him any higher than ten. 9. Kain Colter (Northwestern): Colter may not be the best natural quarterback for the Wildcats, but he’s definitely their best athlete. In addition to quarterback, he also spent time playing running back and wide receiver for Northwestern. In 2011, Colter threw for 673 yards and six touchdowns, ran for 654 yards and nine touchdowns and caught 43 passes for 466 yards and three touchdowns. For Northwestern, it is simple: Get him the damn ball. 8. Caleb TerBush (Purdue): From everything I’ve heard, Purdue doesn’t even know who its starting quarterback is going to be. It’s a race between TerBush and Robert Marve, who has been playing college football for about fifteen years now. My guess is the Boilermakers will go with TerBush, who threw for nearly 2,000 yards and 13 touchdowns last year. 7. MarQueis Gray (Minnesota): Gray has all of the physical tools to be an All-Big Ten selection. The 6’4” 240 quarterback has a deadly combination of size and speed, but he hasn’t lived up to all of his hype—now entering his senior season. He did take major strides last season, though, under coach Jerry Kill. Gray threw for nearly 1,500 yards last season and ran for 966, scoring 14 total touchdowns. But, like Roberson, Gray does not have much help as he plays for a team that finished 3-9 last season. 6. Nathan Scheelhaase (Illinois): Illini fans were left wanting more from Scheelhaase in 2011. After a very promising freshman campaign in which he threw for over 1,800 yards, ran for 868 yards and scored 22 total touchdowns, Scheelhaase showed little improvement in h is sophomore season. In fact, many Illinois supporters say he took a step backwards during his sophomore campaign. He threw for just 13 touchdowns and ran for 624 yards. Losing superstar wide receiver A.J. Jenkins won’t make things easier for him either, but Scheelhaase is another dual-threat quarterback that has the ability to drive opposing coaches crazy.